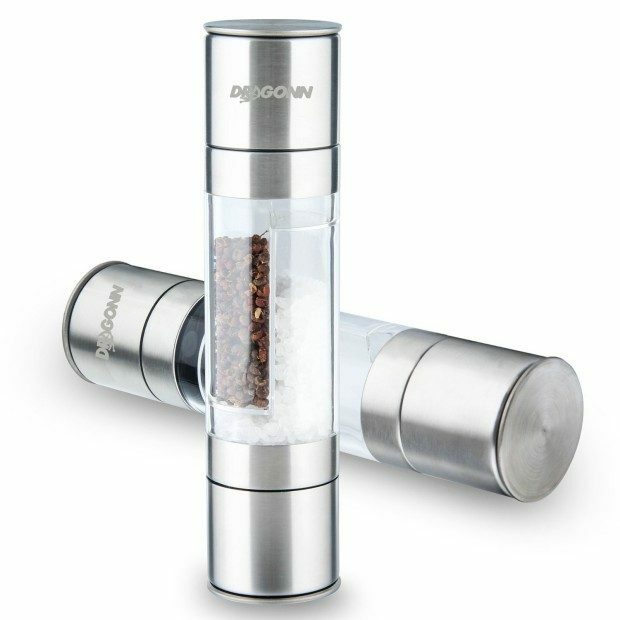 DRAGONN 2-in-1 Salt and Pepper Adjustable Grinder Set Only $10.99! You are here: Home / Great Deals / Amazon Deals / DRAGONN 2-in-1 Salt and Pepper Adjustable Grinder Set Only $10.99! Down From $24.99! DRAGONN 2-in-1 Salt and Pepper Adjustable Grinder Set Only $10.99! Down From $24.99! Add a beautiful salt & pepper mill to your holiday dinner! Head over to Amazon to order the DRAGONN 2-in-1 Salt and Pepper Adjustable Grinder Set Only $10.99! Down From $24.99! Get FREE shipping if you are a Prime member or on orders of $35+! Easily add black peppercorn, salt and other spices to this sleek stainless steel salt and pepper grinder. Sleek – and stylish design with a durable stainless steel body and an acrylic glass see through window. With the DRAGONN 2-in-1 Salt and Pepper Grinder Set you can easily adjust the grinding setting by simply twisting the knob on the ends of the mill. Additional features include a base for precise seasoning, an acrylic viewing chamber to easily identify the contents. We Offer An Iron-Clad 3 Tier 100% Money Back Guarantee: If you’re not 100% happy with grinder set, ship it back and we will refund your money. If the product breaks or is damaged, ship it back and we will replace it for FREE. Even if you lose the grinder, just let us know and we will send you out a replacement for FREE!